The Phantom is among of us! The continuation of Uta Island Resort Murder Case. Kindaichi starts the unwillingly investigation after they found Sakurazawa's body. After Kindaichi can't get any helps from Akechi, this time he called his trusted policeman. (One of the main character) and asks some helps to him. But, in the same time, Phantom had stepped to the next act. That is a preparation of the second murder! 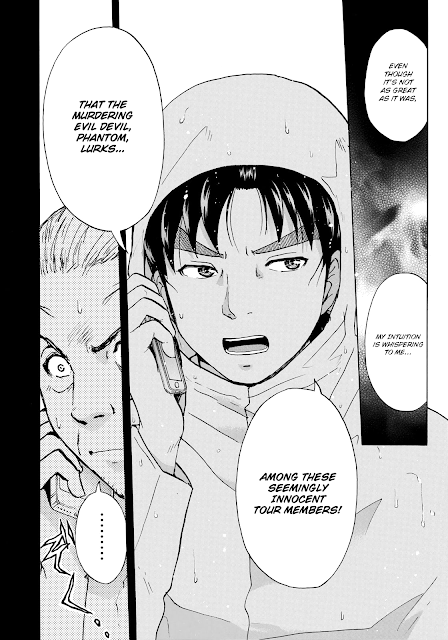 Also, in this chapter, Tatebayashi had mentioned one of Kindaichi Kousuke's case (also one of the finest Japanese detective novels ever), Gokumon Island. Gokumon Island is really a great novel. Silakan download dan jangan lupa beli komiknya di toko buku terdekat. Be aware this blog is only for promotion purpose. All content belongs to the original creators. Thanks for this new chapter!